The mere fact that the will recites your address in a different state is not a problem. You don’t have to redo your will just because it gives an old address. When you signed the will, that was your address and that fact will never change. The same goes for addresses of beneficiaries – if they have moved, you don’t have to change your will to put in new addresses. If one of the reasons you are moving to another state is to change your tax domicile, you might want to consider completing a new will. For example, if you have a residence in Florida and Pennsylvania, and you want to be treated as a resident of Florida for income tax purposes and a non-resident of Pennsylvania, then you might want to consider completing new Florida will. You should consider completing a new will, not because the Pennsylvania will isn’t valid, but because where your will was made is one factor that will be considered when you are trying to prove your domicile. The state where your attorney practices and the state your estate plan lists as your address is one factor in a long list of factors that will be examined to determine which state is really your domicile. The fifty states have varying requirements for witnesses. For example, can a beneficiary be a witness? In some states yes, in other states no. 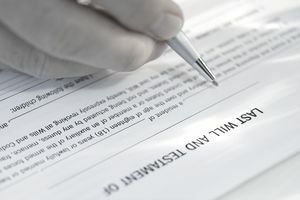 Let’s say your will was made in a state where a beneficiary was a witness and that was legal, but you die a resident of a state where a beneficiary can’t be a witness. What happens? The law of most states is that a will is valid if it is executed in accordance with the laws of the state where it is signed. This is called a “conflicts of law” rule and it is used to determine which state’s law applies for what purpose. So, if the state where the decedent dies had this rule, (that the will is valid if signed in accordance with the law of the state of execution) then the will would be valid even though the state in which the person died would not have recognized such a will under its own laws. Some states require that if you wish to disinherit a child or any issue, you must specifically state your intention to disinherit in the will or provide a nominal bequest, such as $1.00 to the person you wish to disinherit to make it clear that you have not simply forgotten them. On the other hand, some states do not require this. For an example, if you make a will in Pennsylvania that leaves nothing to one of your children, that will is valid in Pennsylvania and the disinherited child has no claim against your estate. However, if you die a resident of another state, such as Massachusetts, where disinherited children have to be specifically mentioned and disinherited in the will, your intentions may not be carried out. In Massachusetts, an omitted child would be entitled to receive the same amount that they would have received if you had died in the state. Let’s say a mother’s will leaves her property in equal shares to her children. The will is silent as to what happens to a share for a child who predeceases the mother. In some states, the deceased child’s share would automatically pass to that deceased child’s own issue. In other states, the share would be divided among the surviving children and the grandchildren through the deceased child would receive nothing. Again, this is a rule of construction or interpretation and the answer will vary from state to state. In some states, a subsequent marriage revokes a will, in others it doesn’t. In some states a divorce revokes a will, in others, it just revokes any benefit for the former spouse. In some states, a special language is required to streamline administration, such as relieving the executor from posting a bond or eliminating the need for the appointment of a guardian ad litem. States have various statutes about the apportionment of death taxes, that is, which beneficiaries have to pay and which don’t. The states have varying state death taxes and varying rules for the taxation of the income of trust and estates.